The roundabout at Barton Highway and Gundaroo Drive is a major problem for not just Crace, but all of Gungahlin, and something is finally being done. We aren’t getting the flyover that everyone wants, but rather traffic lights. Why? A few weeks ago, I spoke to a representative from TAMS about the decision to signalise (install traffic lights) this intersection. In response, TAMS produced this . Truth be told, I put it on the backburner and forgot about it until it popped up via Gungahlin Community Council this morning. The fact sheet runs through background of the site and road, site constraints, flyover considerations and finally notes about the signalisation. 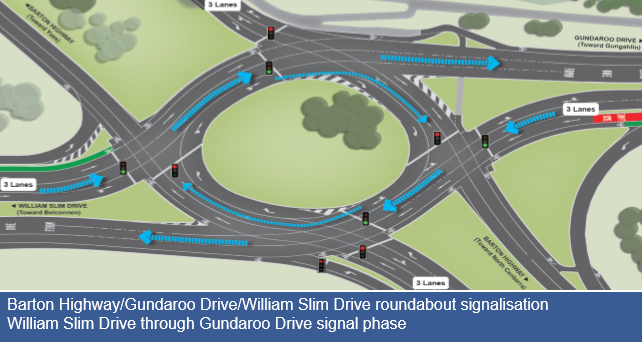 An interesting point is the difference between flying Barton highway over William Slim/Gundaroo Drive and vice versa. The current Labor government so strongly preferred to fly Barton Highway over the top, that the cheaper alternative (currently proposed by the Liberal opposition) appeared to never be fully investigated. Instead of a best case and final solution of a flyover, the government is moving ahead with installing 9 sets of traffic lights at the intersection. The justification revolves around money, and the cost/benefit of the various solutions. TAMS have done modelling and simulations on the intersection and the region, taking in to consideration population growth, suburban development, public transport, and other data. Punching all this in to their simulation programs, signalisation of the roundabout is projected to give a "pretty good" solution through to the year 2031. How that plays out in reality is still to be seen.